Highways for LIFE project showcases gave highway professionals a first-hand look at accelerated bridge construction techniques in South Carolina and precast concrete pavement systems in California. Nearly 50 people traveled by boat to check out the South Carolina Department of Transportation's work on the Ben Sawyer Bridge, a steel swing-span bridge over the Intracoastal Waterway in Charleston County. They also listened to presentations on the benefits and risks of accelerated bridge construction, planning and building the Ben Sawyer Bridge, and lessons learned from the project. The project involved rehabilitating the historic bridge. The new approach superstructure was constructed on site and rolled into place. The swing span and its components were built off site and floated into place on barges. As a result of the accelerated construction methods, the traffic impact was limited to seven days instead of the eight months needed for traditional construction methods. The modular construction method was designed to enhance work zone safety by limiting motorists' exposure to temporary construction traffic control and workers' exposure to traffic hazards. Fabricating, assembling and inspecting the swing span in a controlled environment is expected to improve the bridge's quality. The showcase participants represented eight state and county agencies, the Federal Highway Administration, the University of Florida and industry. A showcase in Ontario, Calif., demonstrated the use of precast concrete pavement systems, modular panels formed off site and installed during off-peak travel times. Nearly 90 people representing 11 state highway agencies, FHWA and industry attended. 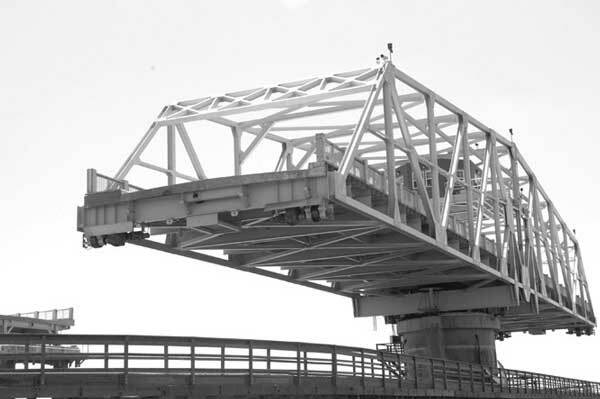 Highway professionals from around the country observed the results of accelerated bridge construction on a swing bridge in South Carolina. 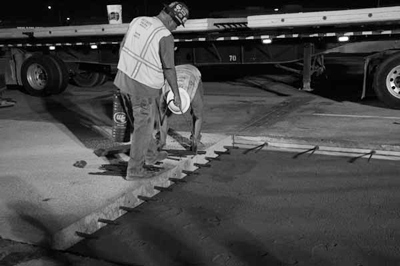 The California Department of Transportation chose precast concrete pavement systems to boost the durability and speed up the rehabilitation of a section of Route 15 in San Bernardino and Riverside Counties. Using the innovation enabled the contractor to replace pavement sections quickly during nighttime and weekend lane closures, reducing impact on motorists by 70 percent over traditional construction methods. The project also used analytical software to optimize the construction schedule and traffic control plan. Showcase presentations focused on the value of precast concrete pavement systems in the pavement management toolkit, planning and constructing the California project, the use of road safety audits to enhance the safety of roadway design and operations, and the use of construction scheduling and traffic control software. Participants in the showcase visited the job site at night to observe the installation of concrete panels. They arrived to see the grouting of slabs put in place the previous night and the removal of existing concrete pavement sections to be replaced. They watched preparation of the subbase and the placement of half a dozen new panels. The next morning, they went to a plant to watch the casting of concrete panels. They observed the processes involved in pouring and finishing the slabs. They also viewed the stockpile of completed slabs awaiting transport to the job site. Both the South Carolina and California projects were built with the help of Highways for LIFE funding, which FHWA awards to projects that use innovations to meet highway user-focused performance goals. Highways for LIFE projects typically feature showcases at which transportation stakeholders from throughout the country can observe a variety of innovations in action. They can take what they learn back to their own states to try on projects, accelerating the spread of innovation to benefit highway users. For information on upcoming Highways for LIFE project showcases and presentations from past events, visit http://pdshowcase.org/. Four states will receive Highways for LIFE grants to build highway and bridge projects that use innovations to improve safety, quality and user satisfaction while minimizing construction congestion. The new grants, which will fund the use of innovations such as a road safety audit, hybrid composite bridge beams and trenchless culvert technology, bring the total of Highways for LIFE demonstration projects to 28 in 22 states and the District of Columbia. 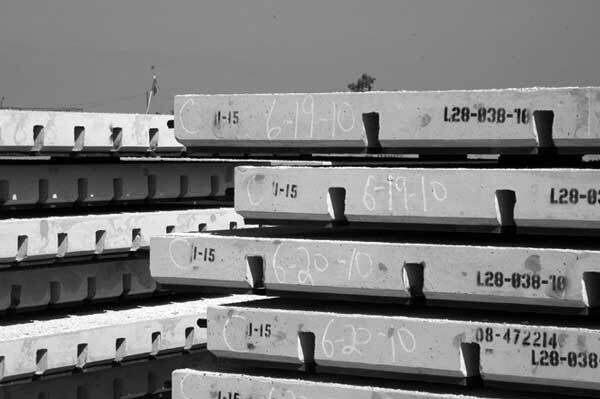 Completed precast slabs are ready for transport to the construction site. The grants provide states with financial incentives to try proven but rarely used innovations. On each project, states use innovations to meet customer-focused goals that significantly improve performance in key areas—safety, construction time and congestion, quality and user satisfaction. Many projects also include showcases at which transportation professionals from around the country can observe innovations in action. The California Department of Transportation will use its grant to make safety improvements when it applies a hot-mix asphalt overlay to a section of Mountain Ranch Road in Calaveras County. The agency has set a goal of reducing the fatality rate by 50 percent on the road section, which has a higher-than-average fatality rate. The agency plans to conduct a road safety audit, in which an independent, multidisciplinary team will examine the roadway to identify safety issues and make recommendations for improvements. It will install highly retroreflective striping on top of ground-in fog and centerline rumble strips to help keep drivers from drifting off the roadway. It also will use the safety edge, a paving technique that can reduce roadway departure crashes. The New Hampshire Department of Transportation will use multiple innovations when it rehabilitates a bridge on the U.S. 3/New Hampshire 11 Bypass in Gilford. The project is designed to improve the condition of the overpass structure with minimal impact on highway users. Using precast panels will enable the agency to replace the bridge deck in about 2.5 days, rather than the 45 days that traditional construction methods require. The project also includes the use of high-performance materials and deck joint details, monitoring of bridge deck health and improvement of traffic control features. The Missouri Department of Transportation will use hybrid composite beams for the construction of three bridges. The project is part of the Safe and Sound Bridge Improvement Program, a program to replace or reconstruct the state's lowest-rated bridges by 2013. Using hybrid composite beams, which are lighter than conventional concrete beams, is expected to reduce construction time on the three-bridge project by about 25 percent. The beams have a fiber-reinforced plastic shell that can provide a service life beyond 100 years. They also require minimal maintenance because they don't rust, require no painting and won't crack like concrete. Showcase participants watched the nighttime placement of precast concrete pavement slabs in California. The Vermont Department of Transportation will use trenchless technology to rehabilitate two deficient culverts along Interstate 89 in South Burlington and Colchester. The innovative technique involves installing linings in the existing culverts, rather than the traditional process of excavating the roadway and replacing the culvert. The use of trenchless technology to reconstruct the culverts will minimize traffic disruption and increase worker safety during construction. It's also expected to be less expensive than using traditional culvert replacement methods because it eliminates the need for excavation. The safety edge, a paving technique that can reduce roadway departure crashes, is steadily becoming a standard practice in Iowa. Forty-four percent of the state's traffic fatalities occur on secondary roads. And paved secondary roads account for a substantial share of Iowa's single-vehicle roadway departure fatality and major injury segments. Iowa's paved two-lane roads carry a wide range of traffic, including semi-tractor-trailers and farm equipment, which accelerates erosion of gravel and earth shoulders and increases the likelihood of crashes when vehicles' right-hand tires drop off the pavement edge. The sudden drop-off makes it difficult for a driver to return smoothly to the proper travel lane. All of those factors explain why paved secondary roadways are ideal candidates for the safety edge, a Highways for LIFE Vanguard Technology. With the safety edge, an attachment, or shoe, is added to an asphalt or concrete paver to create a 30- to 35-degree taper from the top of the pavement to the graded shoulder. Success with the safety edge led the Iowa Department of Transportation to adopt a policy requiring it on all projects with a paved shoulder less than four feet (1.2 meters) wide. The contractor has the option of using the safety edge on roadways with wider paved shoulders in lieu of placing a temporary gravel fillet to reopen newly paved lanes to traffic. The Vanguard Technology process uses dedicated teams, proven marketing approaches and designated funding to accelerate the deployment of innovations such as the safety edge. As part of the safety edge effort, the Federal Highway Administration's Safety Edge Team is evaluating up to a dozen demonstration projects to document the safety, constructability and quality of the innovation. Since 2008, FHWA has worked with state and county officials and contractors in Iowa to hold three demonstrations, each with an open house, to showcase the safety edge. More are coming. "We plan to construct 19 more demonstration projects in 10 Iowa counties this construction season," said Jerry Roche, safety and traffic operations engineer with FHWA's Iowa Division. "Some of those will have open houses and some will not. We recently did one in concrete pavement, and there will be one more concrete project this year. The rest of them will be done with asphalt." The first safety edge project under that effort was built in Louisa County on County Road X-99. The contractor was a willing partner, Roche said, to improve safety of the traveling public and reduce liability during construction. The contractor found no adverse impact on production and no significant increase in the amount of material used. An open house was held with speakers from Louisa County, Iowa DOT, Asphalt Paving Association of Iowa, the contractor and FHWA. "As we finished up paving that project, the contractor requested permission from the Iowa DOT to incorporate the safety edge on their next paving project, State Highway 143 in Cherokee County," said Roche. "That project was also successful, and demonstrated that the safety edge could be built using warm-mix asphalt with no adverse effects." Success on the asphalt projects sparked interest in the portland cement concrete (PCC) paving industry. Roche said the multidisciplinary committee provided the perfect forum for the creation of a PCC safety edge design. Mike McClain, Jones County engineer, had a previously let federal-aid project and agreed to incorporate the safety edge by contract modification. 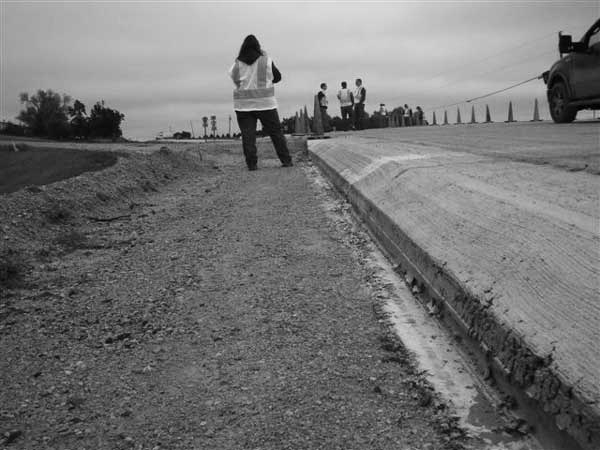 The nation's first safety edge in concrete was placed in Jones and Linn Counties in Iowa. That became the first PCC safety edge project in the country—County Road E-34 in Linn and Jones Counties. Several stakeholders, including FHWA, the Institute for Transportation at Iowa State University (InTrans), Jones County, Linn County, the Iowa Concrete Paving Association, and the contractor all hosted an open house for the project. InTrans has a contract with FHWA and Iowa DOT to evaluate the safety edge technology. Activities include measuring the edge drop after placement, photographing each project, obtaining cost records if safety edge costs can be separately identified, and interviewing contractors and agencies for their reactions. "The $25,000 received in Technology Deployment funding has greatly advanced the state of the practice of highway paving in Iowa by providing a recoverable slope at the pavement-shoulder interface," said Roche. "The end product is systematically improving safety at minimal cost." To learn more about the safety edge, go to www.fhwa.dot.gov/innovation/everydaycounts/edc-1/safetyedge.cfm. The use of whitetopping—paving concrete over asphalt—and full lane closure on a North Dakota highway project cut construction time by more than half while enhancing safety for workers and the traveling public. The project successfully demonstrated the constructability of whitetopping and enlightened designers and contractors alike on the viability of this innovative rehabilitation method, according to North Dakota Demonstration Project: Whitetopping on U.S. 2 West of Rugby, a Federal Highway Administration report on the project. The project used a grant from FHWA's Highways for LIFE initiative to try innovative techniques to rehabilitate an 8.2-mile (13.2-kilometer) stretch of deteriorated hot-mix asphalt pavement on westbound U.S. 2. The innovations were aimed at helping the North Dakota Department of Transportation meet Highways for LIFE performance goals on safety, construction congestion, quality and user satisfaction. It was the first time the North Dakota DOT had used whitetopping on a major project. It chose the technique because it improves the road's durability and reduces maintenance needs. The agency developed new specifications for the project, using whitetopping specifications from Colorado, Illinois, Iowa and Michigan as a basis. Whitetopping offered the agency a cost-effective rehabilitation alternative that restored ride quality in the westbound lanes of U.S. 2 while leaving the existing HMA pavement in place as a sublayer. The job involved milling about 1 inch (25.4 millimeters) of the asphalt surface and overlaying the milled surface with seven inches (178 millimeters) of portland cement concrete pavement. A North Dakota project featured whitetopping rather than a conventional asphalt overlay on a deteriorated highway section. Because U.S. 2 is a four-lane divided highway, the project presented a good opportunity to use full lane closure by shifting all traffic onto the eastbound lanes, removing travelers from the work zone and enhancing worker and public safety during paving. By closing both westbound lanes at once, the contractor was able to pave the road in one pass rather than the two used in traditional staged construction, reducing paving time. No motorist crashes or worker injuries were reported during construction, so the project met the Highways for LIFE performance goals for safety. An improved riding surface and new safety features, such as turn lanes and updated should slopes, are expected to lower crash rates in the future. Using full road closure on the westbound lanes and paving both lanes at once cut construction time to just seven weeks, less than half the 17-week construction time estimated for traditional construction methods. That surpassed the Highways for LIFE goal of a 50 percent reduction in the time highway users are impacted. Quality was measured in terms of smoothness and noise both before and after construction. The project did not achieve Highways for LIFE goals for either. But the road's International Roughness Index measurement dropped 64 percent after construction, a significant increase in smoothness. And the measured sound intensity of the new pavement is at a reasonable level for similar textured pavements. In a post-construction survey, the public gave high marks to the use of full lane closure to get the job done faster, as well as to the finished product. That means the project exceeded performance goals for user satisfaction. An economic analysis compared the costs of this innovative project with those of a similar job done traditionally. The analysis found that the cost of both methods is comparable over the life of the pavement, but minimizing construction time with innovative techniques saved $119,577 in user delay costs during construction. 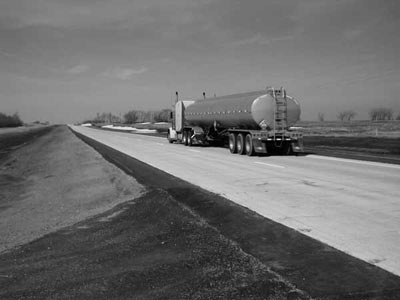 A North Dakota project featured whitetopping rather than conventional asphalt overlay on a deteriorated highway section. To view follow-up reports on Highways for LIFE demonstration projects, go to the "Project Summaries" section at www.fhwa.dot.gov/hfl/projects. To learn more about whitetopping, see https://www.fhwa.dot.gov/hfl/projects/nd_whitetopping_us2.pdf. Millions of tons of material are recycled each year for highway applications, but there's plenty of room for growth, according to Steve Mueller, Federal Highway Administration pavement and materials engineer. "We're already doing a pretty good job of it, but we can do better," he told participants in a Web conference on the use of recycled materials in roadway construction. The session was part of the "Innovations" series sponsored by Highways for LIFE and the National Highway Institute. FHWA's 2002 recycling policy stipulates that "recycled materials should get first consideration when looking at rebuilding new roads or resurfacing existing roads," said Mueller, who moderated the session and provided an overview on recycled materials for highway applications. Not only does recycling conserve materials, it can reduce project costs, lessen the strain on the nation's landfills and provide a readily available source of high-quality materials. "A lot of times, the best materials to use are already out there on the road," Mueller said. One is recycled asphalt pavement, or RAP, which consists of 95 percent aggregate and 5 percent asphalt binder. A project that uses 30,000 tons of RAP can replace 28,200 tons of new aggregate and 70 6,000-gallon transport trailers of asphalt binder. Recycled asphalt pavement is a green solution that can be used in both hot-mix and warm-mix asphalt. Every state allows the use of RAP in hot-mix asphalt pavements, and the highway industry recycles 100 million tons of RAP a year. Twenty-three states now have experience using high-RAP HMA mixes containing more than 25 percent RAP. Eleven states have tried projects with high-RAP content combined with warm-mix asphalt technologies to further enhance energy savings. Another available material is recycled concrete aggregate, or RCA. As aggregate pits move farther from congested urban cores, aggregate must be hauled longer distances to get it to job sites. RCA avoids the need to mine and haul that aggregate, Mueller said. "When you start looking at the numbers, we do a whole lot of recycling both on the concrete side and asphalt side," Mueller said. In fact, asphalt pavement is the most recycled material on earth, with a recycled volume 13 times greater than newsprint, 89 times greater than aluminum cans and 267 times greater than plastic containers, according to the Asphalt Pavement Alliance. Fly ash, generated when coal is burned, is used as a cement substitute. Shredded scrap tires are used instead of gravel and sand and as lightweight fill. Ground asphalt roof shingles are recycled into asphalt paving mixtures. Slag, a byproduct of steel production, works well as aggregate for high-volume roadways and in applications requiring high skid resistance. 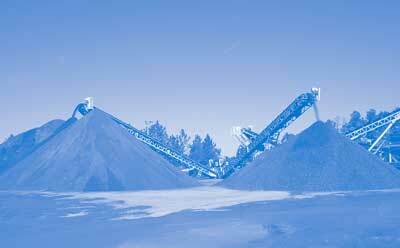 Foundry sand is used for fills and embankments, roadway base material, cement feedstock and HMA aggregate. Rick Givan, president of Recycled Materials Co. Inc. in Denver, Colo., discussed lessons learned on two major pavement recycling projects. They involved removing and recycling 6.5 million tons of concrete and asphalt from taxiways, runways and aprons at Denver's Stapleton International Airport and 4 million tons at the decommissioned El Toro Marine Corps Air Station in Irvine, Calif.
"Project-specific recycling on a major redevelopment project offers opportunities to use a major urban resource, reduce and eliminate disposal waste, reduce project impact on the community and dramatically reduce costs," Givan said. Michael Blumenthal, executive director of the Rubber Manufacturers Association, outlined the group's program to develop markets for shredded scrap tires, known as tire-derived aggregate, or TDA. "The use of TDA is a major step in developing the large-scale market infrastructure needed to resolve the nation's scrap tire problem in an environmentally and economically sound manner," he said. Tire shreds have properties that civil engineers need, Blumenthal said. They're one-third the weight of soil, drain 10 times better than soil and insulate eight times better than soil. They can be used as lightweight fill for highway embankments, retaining wall backfill, insulation to limit frost penetration and vibration attenuation for rail lines. Steve Jackson, manager of N.B. West Contracting Co. Inc. in St. Louis, Mo., described the use of recycled asphalt shingles, or RAS, on Missouri paving projects. The Missouri Department of Transportation's use of RAS grew from 20 tons on its first project on a St. Louis street in 2005 to 53,000 tons in 2009. Not only can RAS use save landfill space, reduce asphalt production costs and improve pavement quality, it's a green practice that can enhance the public image of the construction industry, Jackson said. FHWA Pavement Recycling, www.fhwa.dot.gov/pavement/recycling, includes FHWA's recycled materials policy. Recycled Materials Resource Center, http://rmrc.wisc.edu/, has resources such as User Guidelines for Byproducts and Secondary Use Materials in Pavement Construction. Green Highways Partnership, www.greenhighwayspartnership.org, features case studies and publications. To register for Innovations Web conferences or view recordings of past sessions, visit www.nhi.fhwa.dot.gov/about/innovationseries.aspx. Precast concrete pavement systems technology is expected to cut months from the construction schedule of a project replacing a stretch of deteriorated pavement on Interstate 215 in Salt Lake City, Utah. A grant from the Highways for LIFE initiative to expand innovation use will help the Utah Department of Transportation use PCPS technology instead of traditional cast-in-place methods on the 800-foot-long (244-meter-long) section of the interstate. PCPS is one of the Highways for LIFE Vanguard Technologies, a group of high-payoff innovations that teams are working to deploy rapidly across the country. At least nine states have used or are planning to try PCPS on highway renewal and repair projects. PCPS use is expected to save a substantial amount of on-site construction time on the Utah project. Each precast panel can be placed in seven to 10 hours or less. By contrast, cast-in-place methods require seven to 10 days for curing of the concrete. Plus, PCPS allows on-site construction to occur during off-peak travel times, lessening the impact on motorists. UDOT plans to limit the project's construction time to 40 days with the use of PCPS. Conventional methods are estimated to require four to six months because of cure times. According to the Federal Highway Administration Utah Division, the project is expected to be completed by the end of the 2010 construction season. "It is expected that work zone safety will improve with the use of PCPS," UDOT said in its Highways for LIFE grant application. "Primarily this is due to the reduction in construction time and a reduction in exposure to work zone hazards for the workers and traveling public." Also, PCPS will permit off-peak construction when traffic volumes are lower, which is expected to reduce the likelihood of crashes. Minimize traffic impacts by performing concrete panel curing off site. Improve the curing environment with greater control over concrete temperature, moisture and cure time. Reduce traffic disruptions from seven to 10 days per panel to seven to 10 hours. Allow for construction at night with normal operations during the day. Minimize traffic impacts by reducing the overall construction schedule. Improve work zone safety by minimizing exposure time for on-site workers and the traveling public. Increase the quality of design by reducing dependence on weather and increasing the control of the quality of elements and systems under a controlled environment. Reduce traffic control costs by reducing construction time. The existing concrete pavement, built in 1969, has extensive cracking and several potholes in the outside lane. Several of the pavement panels have shattered into four pieces or more. The new panels, 12 feet (3.6 meters) square by 9 inches (228.6 millimeters) thick, will be precast off site in a controlled environment and transported to the job site. Once there, crews will remove existing pavement sections, place the precast replacement panels, adjust the level and profile, and reopen the closed segments to traffic within hours versus days. For more information on the project, contact Russell Robertson in the FHWA Utah Division at russell.robertson@dot.gov or (801) 963-0078. To learn more about PCPS, see www.fhwa.dot.gov/hfl/partnerships/bridgetech.cfm.